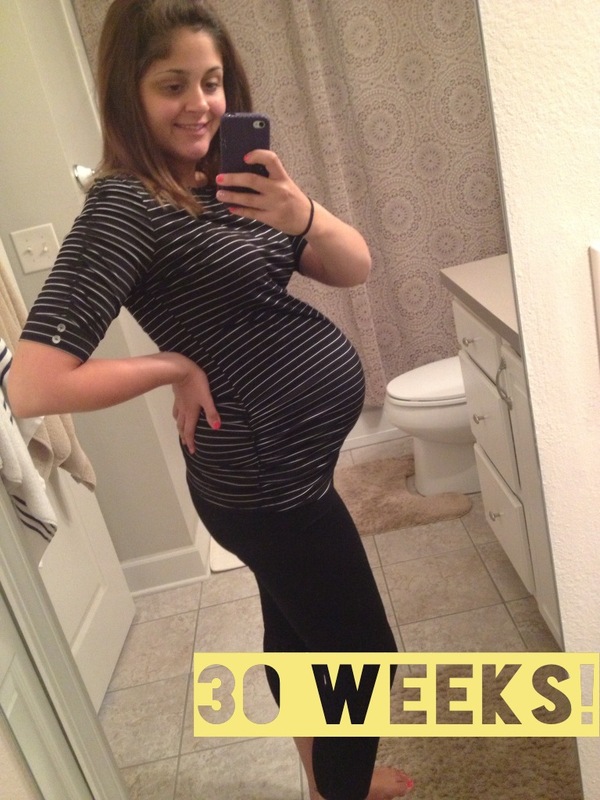 30 Weeks?!?!?! When did that happen? Our little lady is now the size of a head of lettuce. Romaine or iceberg? Good question...I have no clue! As you can tell, I am back to bump pics in the bathroom. Sorry this one is washed out, but I was so not having a "re-do". Which brings me to my next point...I am TIRED! I don't know if it is that I am still recouperating after our NY trip, or that I am really just hitting the point where it will be total exhaustion from here on out. Surely, it is a combination of the two. It just seems like I am extra achey...and no matter how much I rest it's not helping. Maybe part of the problem is that I need to get up and around more? Let's start that....tomorrow maybe. I have a bad case of "NOtivation", so my goal this next week is conquering it. I'll let you know how that goes. Stay tuned! I am up 26 pounds total. It cracks me up how some people say "you're all belly"...then there are the others who ask me things like "twins"? How does that make any sense, and who has the nerve to ask someone if they are having twins?!?! Since I'm back to sleeping in my own bed, I've been sleeping well...just waking up super early like always. It has been a little bit more difficult to fall asleep because that is when she is most active. All last week I was feeling her inching closer and closer to my ribs. The WHOLE ride home she was taking my breath away with some major kicks! At one point we had to stop and walk around...she eventually shifted a bit. I'm convinced this girl doesn't sleep. The other night Stephen had his hand on my belly, she kicked SO hard that we both jumped. This morning I had a doctor's appointment. Everything looked good from the anatomy scan, and my belly is measuring right where it should be (good to know). I have three more "every 2 week appointments"...and then I am really in the home stretch with "once-a-weekers"! It's all getting very real! I was just reading a few of my previous bumpdates, and it is crazy to see how much she has grown. Whoa...I guess in 10 more weeks A LOT can change, huh!?! The bigger your belly gets the skinnier you look!! No joke! I saw you pop up on my feed and I was like "holy smokes she looks super skinny!!!" You look awesome and you're totally all belly! Most people tell me that too but then random people will say "wow, you're huge!" All I know is that I'd never tell a pregnant lady she's huge - she's superwoman growing a human inside of her, how rude! Welcome back! I bet that ride back home was rough, but glad you made the trip. I know what you mean about your own bed. We just had two back to back trips and I am so happy to be home and in my own lumpy mattress that I don't even like that much. Your pictures are great. I'm so excited for you, Stephanie! I really am. I LOVE this bump pic!! I think pregnant women are too stinkin' beautiful and you broke the mold! The tiredness is ALL worth it! Shine on Lady! I love all of these! You are seriously too cute pregnant and you are looking amazing! I'll never understand how some poeple think that they have the right to ask the twins question. Nor do I think it's justified. You look so good!